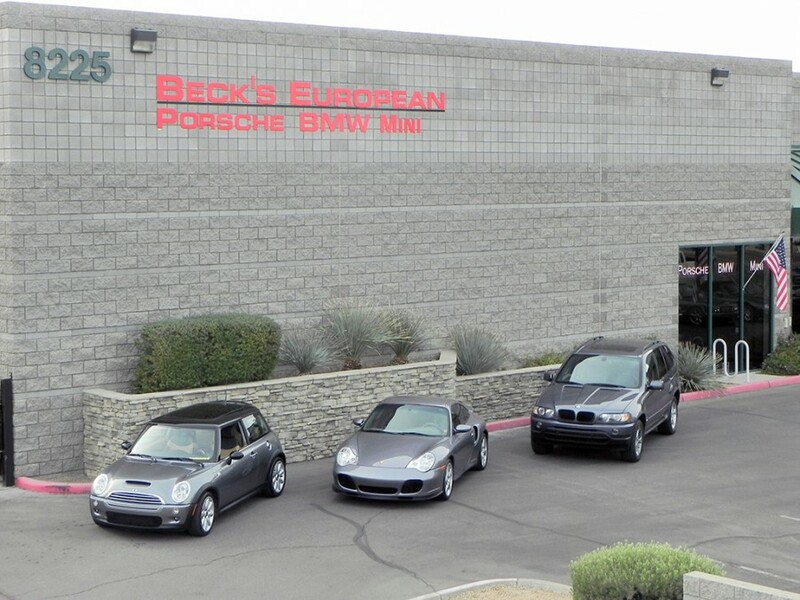 Beck's has been in the Porsche auto service and repair business in Arizona since 1973. Originally founded as a superior alternative to the Porsche dealer network, Beck's has been sought out for Porsche auto service by owners worldwide for forty years. Since then, we have expanded our business to include BMW auto repair and Mini auto repair. We offer a full selection of services to our customers, starting with the most comprehensive pre-purchase inspections available; and including routine maintenance, a full range of service on suspension and brakes, transmission and engine, clutch and drive components, alignment, electrical systems, wheel enhancement and 996/Boxster engine rebuilds. We are also experts in rebuilding and repairing cabriolet tops. Our shop is conveniently located off the 101 and Raintree in North Scottsdale. Just had my Porsche 996 IMS serviced here, also the RMS, AOS & Clutch. Pretty much this place is like a Porsche hospital, the head surgeon is Frank, the owner, & his great mechanics. I would not trust my car with just anyone & was very happy to find a shop that actually knows what they are doing. The Porsche dealer, when I asked them about the intermediate shaft, didn't even know what I was talking about! Thanks Beck's for this great service in Scottsdale, AZ. Beck's European is terrific! They are honest, knowledgeable and reasonable. Their work is full of quality. Frank and his team serviced our 328i and our MINI Cooper S and we are always satisfied. Give 'em a try, you won't be disappointed. I just had my BMW serviced at Beck's and they did the same great job they have done when I had my Porsche serviced there. This is the place every car owner dreams about. If you have a loved car that needs any service....save yourself time and trouble and take it to Beck's European. The facility is spotless. His experience is very deep. His honesty is above reproach. I have taken my ONE OWNER, 1969 911 Porsche, in for some work. I have owned the car for 43 years...and have had the car in many, many service facilities. By far...this shop is the best. Take a minute and read through Beck's European website. Everything he talks about re: quality service, employee attitude, community, etc. are 100% accurate. I live in both Scottsdale, AZ. and Pagosa Springs, CO., traveling back and forth between the two locations. I own a 1999 911 and a 2001 Boxster S. There is no where that I will take either car than Beck's. Frank and his team are totally professional, way better technically than a dealership, and actually love your cars as much as you do. I also own a 2012 BMW 328i and a 2013 BMW X3, which are obviously still under warranty, but guess what? When these cars are out of warranty, they too will be traveling to Beck's for all their maintenance, care, and love. I totally recommend Beck's to anyone that loves their BMW, Porsche, or Mini. Frank Beck was the only one I trusted with my Porsche 914 with for many years starting back in the early 1980's. And, now he's still the only one I trust with my 2002 996 Carerra 4 Cabriolet at his North Scottsdale shop. Frank & his team are honest, fair, knowledgeable and extremely competent. No disappointments in 35 years of Porsche service with Beck's; no kidding! I have been a customer of Beck's European for many years. My 1982 Porsche 911 SC is currently in (Q1-10) having some major engine overhaul work done (typical Porsche engine case oil leaks) along with some interior cosmetic and suspension work done. I want my car to be 'near perfect'. I use the 911 as a Sunday driver only. Beck's has always been supportive of the Porsche experience and have many very experienced employees who have worked Porsche's for decades. Frank Beck, the owner, and an avid Porsche boy racer, recently opened a 2nd location in Scottsdale to make the experience easier to get to for we that live on the east side of town. I have always been satisfied with the work quality performed - never had any issues in almost 10 years. Beck's prices are competitive with local market competitors and I have not found any reason not to continue my use of Beck's services. Highly recommend you give them a call and see for yourself. PS Ask Frank about his racing - he has lots of stories.